The cell cycle has four sequential phases: G0/G1, S, G2, and M. During a cell's passage through cell cycle, its DNA is duplicated in S (synthesis) phase and distributed equally between two daughter cells in M (mitosis) phase. These two phases are separated by two gap phases: G0/G1 and G2. The two gap phases provide time for the cell to grow and double the mass of their proteins and organelles. They are also used by the cells to monitor internal and external conditions before proceeding with the next phase of cell cycle. The cell's passage through cell cycle is controlled by a host of different regulatory proteins. This particular kit is designed to monitor cell cycle progression and proliferation by using our proprietary Nuclear Violet™ in live cells. The percentage of cells in a given sample that are in G0/G1, S and G2/M phases, as well as the cells in the sub-G1 phase prior to apoptosis can be determined by flow cytometry. Cells stained with Nuclear Violet™ can be monitored with a flow cytometer at Ex/Em = 405 nm/445 nm (Pacific Blue channel). Add 1 µL of 500X Nuclear Violet™ (Component A) into the cells containing the growth medium, and incubate the cells in a 37°C, 5% CO2 incubator for 30 to 60 minutes. Note: For adherent cells, gently lift the cells with 0.5 mM EDTA to keep the cells intact, and wash the cells once with serum-containing media prior to incubation with Nuclear Violet™. Note: The appropriate incubation time depends on the individual cell type and cell concentration used. Optimize the incubation time for each experiment. Note: It is not necessary to fix the cells before DNA staining since the Nuclear Violet™ is cell-permeable. Note: Human and rodent stem cells efflux Nuclear Violet™ stain, and this is the basis for the Side Population (SP) technique; the efflux can be blocked with blocking agents like verapamil, fumitermorgin C to prevent dye efflux for accurate DNA content analysis. Monitor the fluorescence intensity by flow cytometry using the 405 nm violet laser (Ex/Em = 405/445 nm). Gate on the cells of interest, excluding debris. Figure 1. DNA profile in growing Jurkat cells with Cell Meter™ Fluorimetric Cell Cycle Assay Kit. Jurkat cells were stained with Nuclear Violet™ for 30 minutes. 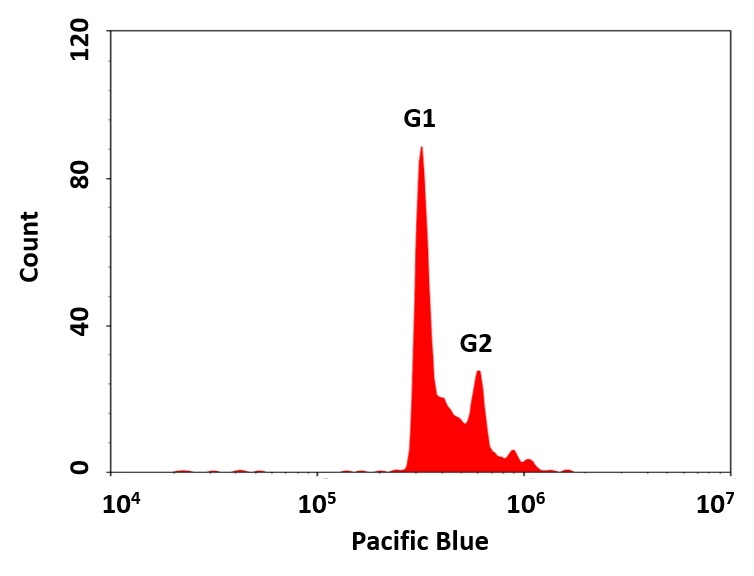 The fluorescence intensity of Nuclear Violet™ was measured using ACEA NovoCyte flow cytometer with the channel of Pacific Blue. In growing Jurkat cells, G0/G1 and G2/M phase histogram peaks are separated by the S-phase distribution.